Eric Idle, a member of the comedy group Monty Python, wrote the lyrics and book to SPAMALOT, with music by John Du Prez, Idle and Neil Innes. WHEN: Saturday, September 16, and runs through October 14. Curtain call for Fridays and Saturdays is 8:00pm and Sundays at 2:00pm. There will be no performances on September 29 and 30. Tickets may be purchased online at www.bcplayers.org, by calling 201-261-4200 or by visiting the box office of the theater during regular box office hours. 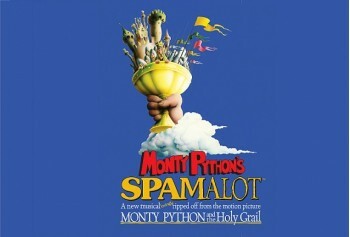 Get ready to roll in the aisles as Bergen County Players (BCP) ushers in the 2017-2018 season with a side-splitting production of SPAMALOT, adapted from the classic 1975 cult film comedy Monty Python and the Holy Grail. Directed by veteran BCP member Jacqueline Poquette of Westwood, the musical opens following a full summer of renovations at the Little Firehouse Theatre at 298 Kinderkamack Road in Oradell. New seats have been installed, and the theater's interior and lobby have been completely refurbished. The original 2005 Broadway production, directed by Mike Nichols, won three Tony Awards, including Best Musical of the season and received 14 Tony Award nominations. During its initial run of more than 1,500 performances, it was seen my more than two million people. Variety's David Rooney wrote that the show "delivers rowdy entertainment that remains sufficiently faithful to its source to satisfy nostalgic fans, while broadening the humor to cast a wider net among musical theatergoers." Idle's partner in crime, John Cleese, a founding member of Monty Python's Flying Circus said, "I defy anyone to go and not have a really fun evening. It's the silliest thing I've ever seen..."
BCP's SPAMALOT is true to the original script of the show with a multitude of shenanigans. It tells the legend of King Arthur and his Knights of the Round Table as they follow God's orders to find the Holy Grail. It features 11 production numbers along with gallant, and not so gallant knights, show girls, show boys, cows, killer rabbits, flatulent Frenchmen and clapping coconuts, added in for sound effects. Jacqueline Poquette, a Life member of BCP, has directed an eclectic mixture of over 30 dramas, musicals and comedies, including A View From the Bridge, Man of LaMancha, Autograph Hound, Who's Afraid of Virginia Woolf?, The Melody Lingers On and the Perry Award-winning The Beauty Queen of Leenane, to name a few. Poquette, who has wanted to direct SPAMALOT for the last five years, decided it was a production that BCP could tackle, despite its challenges. She credits an "extraordinary" crew, as well as the cast, who are die-hard Python fans. "The basic core of what they need to do is in their hearts and souls. They are almost instinctual in their performances." The talented cast of SPAMALOT includes Larry Brustofski of Oakland as King Arthur, Bryan Morris of New Milford as Sir Robin, Dan Loverro of Parsippany as Sir Lancelot, Rich Ardito of Hackensack as Sir Galahad, Bob Ouelette of Westwood as Patsy, Steve Munoz of Caldwell as the Historian and Herbert, and Angela Jeffries of Peekskill, NY as Lady of the Lake. The cast is rounded out by ensemble performances by John Burke of Midland Park, Michael DelValle of New Milford, Ken Fowler of Clifton, Gregory Gwyn of Clifton, Jordon Hinds-Clarke of Westwood, Nicholas McRae of Glen Rock, Elaine D'Addezio of New Providence, Elisabeth Erdmann of Nutley, Elissa Hickey of Oradell, Olivia Lionetti of Westwood, and Debbie Zika of Hillsdale. The production team, besides Poquette, includes Margie McDonough (Assistant Director), Jalmari Vanamo (Musical Director), Vittoria Fronte (Choreographer), Michele Roth (Producer/Stage Manager), Gerard Bourcier (Set Design/Construction), Bunny Mateosian and Joanne Misha (Costumes), Iris Weinhouse (Make-up), Angela Grippo (Hair/Make-up), Rich Ciero (Crew Chief), Judy Rosenberg, Gloria Bumbaco and Sylvia Kates (Crew), Lauren Zenreich (Décor), Terri Caust and Pauline Quinones (Props), Annette Jacobs (Props/Crew), Ray Poquette (Lighting Design), Jill Hendrickson (Lighting Operator), David Luke (Follow Spot Operator), Joe Halajian (Sound Design), Larry Landsman (Publicity), Alan Zenreich (Photography), Marci Weinstein (Program Notes), and Eileen Winkler (Member-at-Large).